Keen Home Reviews - Is it a Scam or Legit? Keen Home’s new automation system uses Smart Vents, their Smart Bridge hub, and a smartphone app to reduce your energy consumption and costs by up to 30%. Imagine that you’re sitting at home comfortably, while working away at the computer. Your chair’s cozy, the ideas are flowing, and the temperature is just right. But as soon as you go to the kitchen and get a glass of water, you notice that it’s much cooler—and less comfortable—than in your office. In fact, you soon begin noticing cold spots all over the house. And no matter what you try, you just can’t seem to get rid of them. But how can you change the situation? After all, the thermostat is located in the hallway next to your office, so it’s never going to get a good reading for your kitchen. This is where Keen Home’s Smart Vents come in. Each of their Smart Vents use sensors to monitor the temperature wherever they’re installed, and then control the airflow accordingly. Want to shut off the air to any rooms that are never used? Looking to better regulate temperature and eliminate hot and cold spots? Keen Home claims their Smart Vents can deliver—while reducing your energy costs by up to 30%! Not only this, but Keen Home’s Smart Vents can also connect to several different smart thermostat models using the company’s Smart Bridge (more about this next), giving each member of your family the ability to add their preferences. But when it comes down to it, will Keen Home help you “take command” of the airflow in your home, or will it just commandeer your bank account? So we can make sure to provide you with all the information you need, let’s start by taking a closer look at exactly how the Smart Vents work. How Do Keen Home’s Smart Vents Work? Installation is easy, too. Simply remove your existing air vent, attach your Smart Vent, and connect it to the Smart Bridge (see the company’s Installation Guide for more information). Each Smart Vent features interchangeable faceplates that magnetically attach to “turn your vents into works of art.” You can even choose wood faceplates that come prefinished, or unfinished ones that can be stained to match your décor. Finally, each Smart Vent is powered by four AA batteries, which should last about three years (you’ll receive a smartphone notification when they need to be changed). Keen Home’s Smart Bridge looks to be about the same size as a traditional wireless router, connects to the internet, operates on a ZigBee platform (we’ll come back to this shortly), and acts as the hub between your Smart Vents, your smart thermostat, and your Keen Home App. The Smart Bridge also features cloud integration, repeater mode (allows it to connect with other Smart Bridges for larger homes, generally 3,000 sq. ft. and over), as well as smartphone control, which is what we’ll discuss next. By itself, Keen Home’s app only gives you the ability to open and close your Smart Vents. But when paired with the Smart Bridge and a smart thermostat (such as Nest Learning Thermostat, SmartThings, or Lowe’s Iris), you’ll be able to remotely control how much air reaches each room and adjust temperature based on your preferences. Manual Mode – Using the app, you can manually control how much air reaches each room. Auto Mode – Simply set each room to the desired temperature, and your Keen Home vents will automatic balance the airflow in order to reach this temperature. 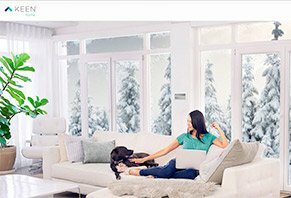 Taken together, by helping you avoid conditioning your home longer than needed, or running your thermostat higher to condition a handful of rooms, the Keen Home system can help you save money on energy bills. But if you’re even remotely familiar with HVAC, your first question might be: Will it cause any damage? Will Keen Home Damage Your HVAC System? Without going too in depth (and far outside the scope of this review), it’s important to remember that your HVAC system is (or should be) finely tuned to properly heat and cool your home. And while it might make sense that shutting off heat (for example) to rooms that aren’t being used will help you save money, this isn’t always the case. Why? Because doing so “creates pressure in the closed-off room, which causes the return duct to pull in cold air from any cracks in windows or doors.” In other words, you’re not stopping air from flowing into the room, you’re simply creating an environment where the wrong kind of air is flowing in. Second, if you close too many vents in your home, this can greatly increase the air pressure inside your ductwork, resulting in your fan working harder and using more energy, potentially damaging parts of your system. The good news is that Keen Home only recommends replacing about 1/3 of your vents with their Smart Vents, and they also include built-in pressure sensors, so this is unlikely to occur. It is, however, something to keep in mind, so if you’re on the fence, be sure to speak with an HVAC professional. Sounds like Keen Home put a lot of cool technology into their Smart Vents! But how much will all this technology cost you? Will Keen Home’s Price Have You Blowing Hot Air? If you’re looking to get started for as little as possible, Keen Home’s Starter kit, which includes two Smart Vents and 1 Smart Bridge, is priced at $195. Herringbone vents (available in four sizes: 4” X 10”, 4” X 12”, 6” X 10”, and 6” X 12”) can be purchased for $79 each, while the Arbor (wood faceplate) model is priced at $129 each. Each Keen Home Smart Bridge will cost you $39, although if you have a larger home, you can purchase multiple units as a bundle. Pro tip: Keen Home operates on a programming language known as ZigBee (we’ll give you some in-depth insight about this in a second). This means that you could theoretically use any ZigBee-enabled hub, versus purchasing a new Keen Home Smart Bridge. According to the company, they recommend purchasing four vents to start, or enough to replace 1/3 of the vents in your home, whichever is greater. If you purchased the bundle above, plus 2 additional herringbone vents, this means you’ll spend a minimum of about $350, plus any other costs (such as a smart thermostat). Given this investment, are customers pleased with their Keen Home System? Are Keen Home’s Customers Hot, Cold, Or Just Right? If purchased directly through their website, Keen Home won’t begin shipping their product until the end of January 2016. However, it appears the Smart Vents have been available through Amazon since the beginning of December 2015 (more in a second). Also, the author noted that while the Smart Vents can “manipulate the temp somewhat by opening, shutting or angling the vents, it's still relying on the thermostat to actually turn the air on or off.” In other words, unless you pair your Smart Vents with a smart thermostat, you might be losing out on a lot of functionality. Similarly, Consumer Reports also provided an overview of what they learned about the Keen Home system at the 2015 ICES. Ultimately, they seemed to like the idea, but noted that if you HVAC system already features at least two independent heating zones, then you might not find much useful about Keen Home. As we mentioned above, there were three customer reviews on Amazon at the time of our research, who gave Keen Home’s Smart Vents an average rating of 3.3. stars. Most seemed pleased with the ability to increase comfort and save money, although none received the Smart Bridge with their order (the biggest complaint), meaning that full functionality wasn’t available. Keen Home appears to have gotten off the ground through a 2013 Indiegogo campaign, where they raised 101% of their $40K goal in one month. It appears that the Smart Vents were originally set to be released in March of 2014, which, based on their most recent estimate, means a delay of roughly 10 months has occurred. Afterwards, in February 2015, founders Ryan Fant and Nayeem Hussain appeared on Shark Tank, where they accepted a $750K deal from Robert Herjavec for a 13% stake in the company. Whew! We know we’ve given you a lot of information about Keen Home’s smart system here, so let’s wrap things up into one bite-size piece. Is Keen Home a Good Smart Home Choice? Average electric bill: $110 (obviously, this will vary depending on dozens of factors, especially the climate in which you live and the type of heating your home uses). If Keen Home saves you 15%, this means you’d shave $16.50 off your bill each month, or $198 annually. A basic Keen Home System costs $350. If you need to purchase a smart thermostat (such as the Nest), you’ll need to come up with another $200. Taken together, if you already have a smart thermostat, it’ll take about 1.75 years to recoup your expenses. On the other hand, should you need a different thermostat to fully take advantage of all of Keen Home’s features (otherwise, you’ll only be able to make rooms a little warmer or colder, but won’t be able to choose specific temperatures), it’ll take you 2.75 years. Is this worthwhile? Only you can decide. But there are a couple more considerations to keep in mind. Consideration #2: Do You Have Other Options? When it comes to directly controlling airflow in your home, your only options (at least at the time of this writing) were Keen Home and Ecovent. However, based on the information we learned in the CNET and Consumer Reports reviews above, the Ecovent system is much more expensive and much more labor-intensive to implement. So, if you’re looking to quickly control airflow in your home for as little as possible, Keen Home seems like your best (and only) real option. Whether we’re talking about Vera Smarter Home Control, Revolv, or just about anything else, ZigBee and Z-Wave are arguably the two most popular protocols for communicating between home automation devices. Need your hub to communicate with your vents? Your smartphone to your lights? These languages can make it happen. But is one inherently better than the other? According to Digital Trends, both protocols use something known as a mesh network to extend their range, and that they use an extremely small amount of power. Really, the biggest difference is their age. ZigBee has been around (or was at least conceived) in 1998, while Z-Wave is much newer. Despite its newness though, Z-Wave is supported by more than 325 manufacturers, so you won’t have any problems finding compatible devices. Bottom line: Where’s this leave you? Ultimately, if you’re passionate about the latest home automation products and/or are typically an early adopter for new tech, Keen Home will probably be right up your alley. And its relatively high price might provide you with a greater level of value. But if you’re only looking to save a ton of money on your utility bills right off the bat, then you might want to wait until Keen Home’s technology drops in price. Instead, you might get more bang for your buck by changing out light bulbs, making sure your home is properly sealed, washing your laundry with cold water, and more! I ordered the wrong size. I measured but didn’t realize that some of the vents I wanted to use them for were not all the same size. I wanted to return two of the vents and buy two more of the correct size. I tried for hours to find out how to return. What I found out was that you need to request an RMA form. Okay, how do I do that? Finally got to the request from which asked for numbers that were on the boxes, on my email receipt or on the invoice. The latter number didn’t exist. The amount of information required for this form was ridiculous. This is 2018! It should not be that complicated to make a return! Once I completed this request, they said they would email me what to do next. Again, it’s 2018, so I expected an immediate response and more than 24 hours later, nothing! In the meantime, I had already ordered the replacement sizes. If I can’t return the wrong ones, I will have spent over $600! The return policy is within 60 days and no questions asked. Really? You asked a lot of questions about numbers. Why couldn’t they just look up my order number or better yet, include a return invoice and label like just about every other company I’ve dealt with?! Bottom line? Be very careful before you hit "submit order" because there’s no going back! I placed a $500 order on their website well over a week ago and only received an order confirmation so far. I tried contacting them via email several times, including using their website chat feature to no avail. I'm starting to think this company has folded or a scam, either way, I'll let American Express deal with them. I ordered my vents and hub back in September. I was told it would be shipped in December. After numerous emails unanswered, I filed a complaint with the BBB and finally got a response from. They keep saying they would ship my order. I receive my order with the wrong sized vent and no trim kit! I've emailed twice and again received no response! They have terrible customer service! I'm filing a dispute with my credit card company. Watch out for these guys. It may be a good product (I don't know), but not worth the frustration and being out hundreds while they hold your money and continue to email you asking for investments. "You've taken a huge step towards increased comfort and efficiency in your home. To get a jumpstart on setting up your new Smart Vent System, familiarize yourself with our Smart Vent setup guide and our FAQ page. If you have half a minute to spare, we'd love to learn how you heard about us. Please take a moment to fill out this quick survey. It will only take 30 seconds. All orders will ship in Spring 2017. Want to track your order? Enter your order number and email address on this page to get the latest information. PS: If you have a question or need to change your order, please send us an email." Write a Review for Keen Home!